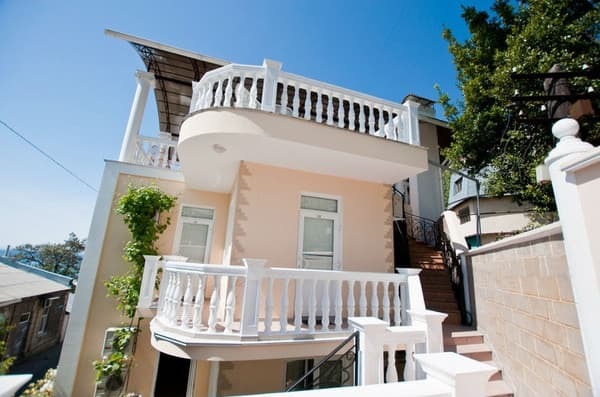 Mini-hotel "Mead" is located in the center of Yalta, 50 meters from Massandra beach. The hotel is a 4-storey building of original architecture. The hotel has comfortable rooms with all amenities, a courtyard, in the courtyard there is an aquarium, a waterfall, a resting place. Each room has its own entrance, good sound insulation. 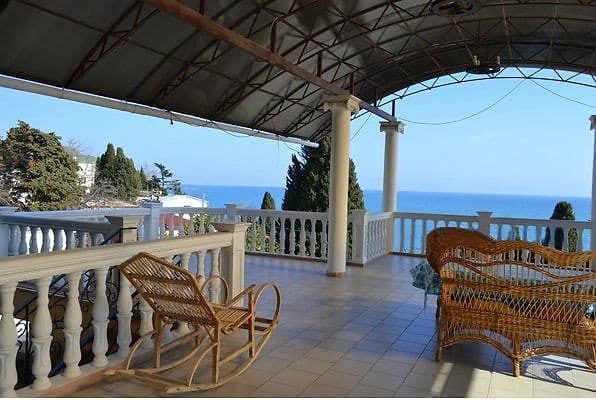 On the 4th floor there is a brazier, a solarium, an observation deck with a beautiful view of the sea and mountains. The Yalta Embankment is a 5-minute walk away. Near the hotel "Mead" is a currency exchange office, a grocery store, a cafe, a specialized wine shop "Massandra". PRICES MAY CHANGE, IT IS REQUIRED TO RECEIVE INFORMATION FROM THE OPERATOR. Description of the room: One room with a separate entrance is located on the 1st floor. The room has a double bed, TV, electric kettle, air conditioning, refrigerator, hairdryer. Description of the room: One-room apartment with separate entrance, located on the 1st floor. The room has two beds, sofa, TV, electric kettle, air conditioning, refrigerator, hairdryer. Description of the room: One-room spacious room is on the 2nd floor. The room has two beds, sofa, TV, electric kettle, air conditioning, hairdryer. Description of the room: One-room spacious room is on the 2nd floor. The room has a TV, two beds, a sofa, an electric kettle, air conditioning, a refrigerator, a hairdryer. Description of the room: Two-room apartments are located on the 1st floor. 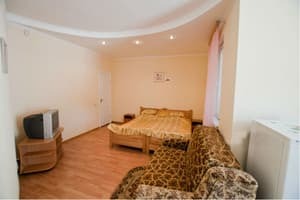 The room has a sauna, bathrobe, slippers, hairdryer, iron, TV, air conditioning, kitchen equipped with electric stove, dishes. Accommodation 2-4 people. Children under 7 years old live in the available places for free. The cost of extra bed is to be specified at the time of booking. 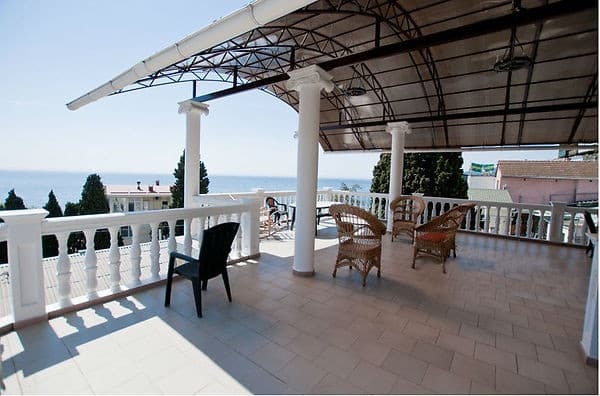 Mini-hotel "Mead" is located in the center of Yalta, 50 meters from Massandra beach. The Yalta embankment is 5 minutes' walk away. 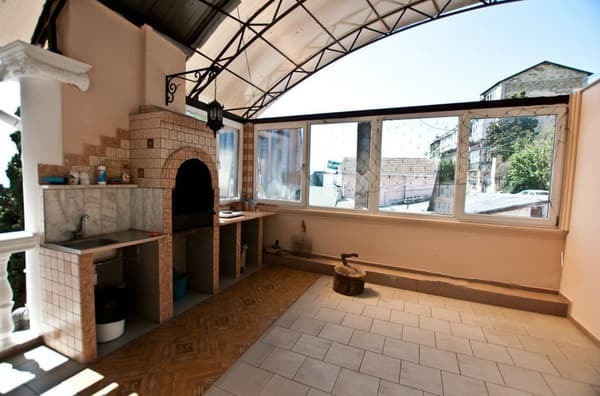 Nearby there is a currency exchange office, a grocery store, a cafe, a specialized wine shop "Massandra". Near the railway station of the city of Simferopol (exit to McDonald's, in the direction of the tower with a clock) are auto- and trolleybus stations. From there, by regular bus, fixed-route taxi or trolleybus number 52 you can get to Yalta in 1,5-2,5 hours. By car: From Simferopol, take the M-18 highway and go to the Angarsk Pass, then through Alushta - along the upper inter-city route (landmark, so as not to get lost in Alushta - the wires of the intercity trolleybus), then - along the upper, intercity route (M-18) along the entire South Coast, another 41 km to Yalta.